Women tell it like it is when it comes to Essure’s side effects. Does Bayer? 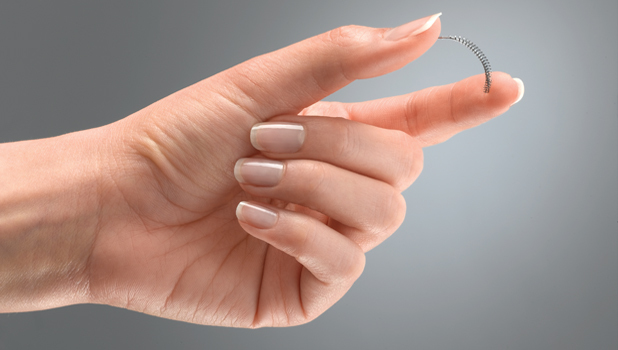 The Food and Drug Administration continues to back Essure as a safe, effective option for birth control — even as it prepares to slap its strongest warning on the device due to the thousands of reports of serious side effects it has received. As long as the FDA backs Essure, its manufacturer Bayer Healthcare will continue to market it to women around the world. But is Bayer’s marketing campaign really enticing enough to make a device that can perforate organs, cause chronic pelvic pain and severe hemorrhaging seem like a viable option for birth control? 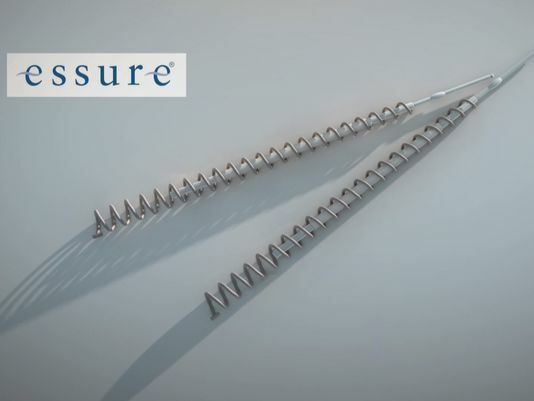 With a powerhouse marketing machine and millions of dollars to back it up, it’s easy to see how something potentially harmful like Essure could be presented as a seemingly benign, even beneficial device by its Big Pharma maker. If you’re a woman looking for birth control options and haven’t seen recent news coverage of Bayer’s sterilization device, your ears may have perked up after reading those statements. Permanent birth control without surgery? Tell me more. So there’s another way of permanently protecting myself against unwanted pregnancies other than tubal ligation and I can get it right in my doctor’s office? Go on. You’re telling me I can protect myself from unwanted pregnancies indefinitely AND there’s virtually no downtime? I can get back to work and my family in a day or two? Can it get any better? Essure is a non-hormonal, 99%-effective form of permanent birth control I can get in my doctor’s office without surgery and with no downtime and at no cost to me? It sounds way too good to be true. That’s because it often is. Women have been getting Essure since the Food and Drug Administration approved it in 2002. 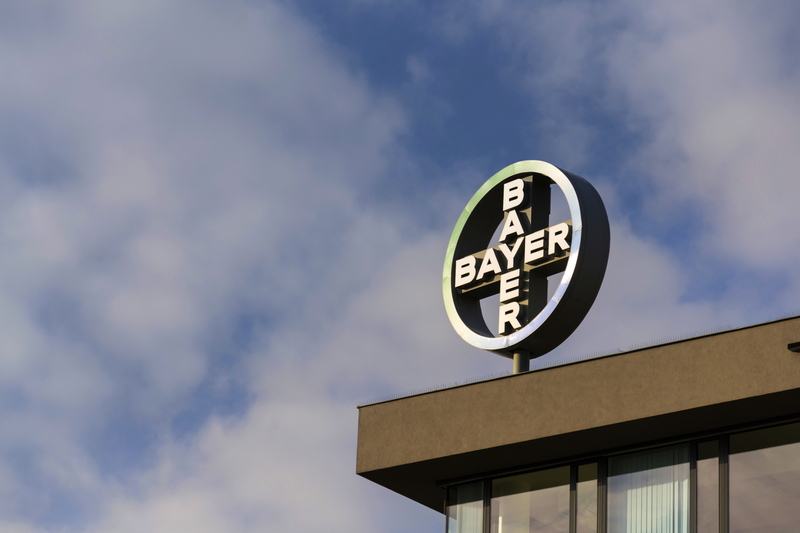 Bayer boasts on its website that more than 750,000 women around the world have been implanted with the device, which consists of two metal coils inserted into the fallopian tubes. The coils incite an inflammatory response within the tubes and scar tissue forms around the device to close the tube. If you’re looking into options for birth control, you might stumble upon Bayer’s Essure website, Essure.com. There you can learn more about what Essure is and how it works. You can also look into the kinds of side effects you might expect from the device. After all, every medical device has risks. But how does Bayer present those side effects to its potential users? Let’s take a look. This is not the full list of possible side effects associated with Essure (those can be found on the Essure label, though some may argue not even the label has a list of all the side effects experienced by women in the real world), but those are the side effects presented on Bayer’s website. There are reports of chronic pelvic pain in women, possibly related to Essure. There are reports of the Essure insert migrating into the lower abdomen and pelvis. If this happens, it may be necessary to surgically remove the migrated device. No birth control method is 100% effective. There is a chance that you can become pregnant after completing the Essure procedure. In the clinical trials for Essure, no pregnancies were reported for women who had the Essure inserts for up to 5 years. Although successful pregnancies have been reported with Essure devices in place, if you do become pregnant, the risks to you, the fetus, the pregnancy and childbirth are unknown. Women who have the Essure procedure are more likely to have an ectopic pregnancy if they get pregnant. Ectopic pregnancy is when the pregnancy occurs outside of the uterus. The pregnancy usually happens in one of the fallopian tubes. Ectopic pregnancies can be very serious or life-threatening. If you have the NovaSure®procedure, a procedure that removes the lining of the uterus to lighten or stop menstrual bleeding, after the Essure procedure, it is unknown if this will affect the blockage in your tubes, and your risk of pregnancy may increase. 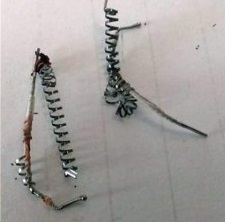 The Essure insert is made of materials that include a nickel-titanium alloy. Once placed inside the body, small amounts of nickel are released from the inserts. Patients who are allergic to nickel may have an allergic reaction to the inserts. Symptoms include rash, itching and hives. But the side effects presented on Bayer’s website don’t seem to capture the very real side effects being experienced by a large number of women who had the device implanted. A quick Google search of “Essure birth control” brings up a number of different results: law firms suing Bayer, FDA warnings, news stories about the many women speaking out against the device. Take a look again at Bayer’s rundown of the possible long-term side effects. Now read what real women have to say about the side effects they have experienced. A uterus ablation, or endometrial ablation, is a surgical procedure that destroys the uterine lining in order to treat abnormal bleeding. Essure is known to cause abnormal bleeding which can manifest as weeks-long periods in some women. For Rhonda, it meant having surgery to correct it. Rhonda also developed the chronic immune system disorder Graves disease, which affects the thyroid and can lead to symptoms like puffy eyes, anxiety and tremor. Jiovana suffered side effects that affected her body both inside and out. Her coils not only caused hemorrhaging so severe it necessitated a diaper, they migrated from their intended position in the fallopian tubes into her uterus and put her health at risk. After reading accounts of the side effects women have experienced in real life with Essure, it seems like Bayer glosses over what can actually happen with this device. Many women who have been harmed by their Essure devices feel as if they’ve been deceived by Bayer. They feel as if they weren’t given all the information they needed about Essure to make an informed decision. Rina from California (quoted earlier) told Hood National Law Group that a mandatory education session set up by her insurance company did not go over the side effects of Essure because it doesn’t contain hormones. 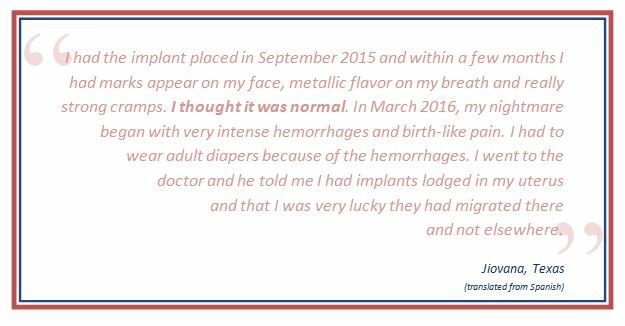 “During the mandatory ‘education’ class at —–, we were shown an Essure video with testimonials [of] people who had it placed and were living a great life. I think 5 people in total were shown. We were never told of any side effects since we were told this was not a hormonal device,” said Rina. As stated earlier, Rina suffered very real, very serious side effects, including pelvic pain and severe hemorrhaging, after receiving her Essure device. She was implanted with the device in July 2014 – 12 years after it was approved by the FDA. Not only did the Essure label include some risks associated with the device, the FDA was receiving thousands of reports of serious side effects by that time. Why didn’t the education session hosted by her insurance company mention them? Many women who have been harmed by Essure feel as if their voices haven’t being heard – by Bayer or by the FDA. Hood National Law Group wants to make sure your voice is heard. If you were injured by the Essure permanent birth control system, you may be entitled to financial compensation. Call 1-800-214-1010 today to see if your case qualifies for an Essure Lawsuit, or use the form on the right-hand side of your screen.